Thank you EPRDF, EDP, AEUP/O, CUDP, MEDREK and all! While we condemn the killings and few election related incidents that happened during the election campaign we salute to all organizations competing in this election for a successful peaceful campaign period. We thank specially the EPRDF, EDP, AEUP/O CUDP and MEDREK for enriching Ethiopia’s democracy. The 4th General Election is upon us.Over the last few months all Political organizations have unfettered access to campaign.What is left now is the decision of voters. All indications are EPRDF will win and to that effect the renowned Artist Solomon Tekalegn with his deep soothing melody agrees and has released his election 2010 single CD which is title "Yiqetil" meaning let him continue.The EPRDF government has worked tirelessly to improve the lively-hood of Ethiopians. 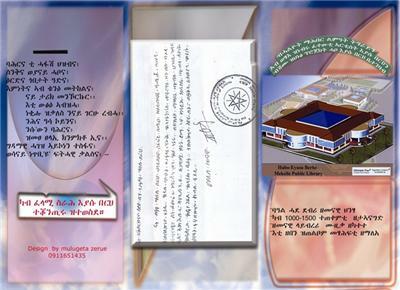 The country is emerging fast out the doldrums.The future is bright with EPRDF. We agree with Solomon Tekalegn...Yiqetil!!!! Click here to listen Yiqetil. Discussion among EPRDF, MEDREK and AEUP supporters in Diaspora. The three supporters, Ato Mekonnen, Ato Shakespeare and Ato Seleshi discuss why they support their respective organizations on investment, land ownership and the democratic process unfolding in Ethiopia. The debate was sponsored by Andinet TV of Seattle. Ethiopia’s coffee origins could change the way people understand Ethiopia, and will be released this fall. It is a 144-page coffee table book that will showcase Ethiopia’s beauty and tell the stories of the multiple cultural understandings and uses of coffee in Ethiopia through words and photos. Interview with Dr Hailu Mengesha. Dr Hailu who lives in the USA was one of the founders of the TPLF. He left TPLF during the first internal crisis known as “henfishfish” during the early years of the armed struggle. Since he left TPLF Dr Hailu has been active in politics but for a long while now he is not a leader or member of any political organization. Recently Dr Hailu shared his thoughts on current Ethiopian politics with an online audiences at Alula Aba Nega pal talk online Discussion. Hydropolitics and Regional Stability in the Nile Basin. Zenawi said Egypt's approach to the distribution of the Nile is out of date [Al Jazeera]Ethiopia's prime minister has rejected a threat by Egypt to prevent the building of dams and other water projects upstream on the Nile river. Meles Zenawi told Al Jazeera on Wednesday that Egypt will not be able to stop his country from building dams on the river. Egypt has intensified various diplomatic efforts to delegitimise recent new Nile deal signed by four countries. Comment:There is no reason what so ever for Egypt to be paranoid about a new Nile Deal. The new deal is a win win for all. Egypt should know Ethiopia or any of the upstream countries can not watch their people die by thirst and hunger. There is enough water for all to share! Ethiopia is a country under construction. Drive out of the main Bole International airport in the capital, Addis Ababa, and you are immediately confronted by building works all the way down to the central Meskel square. In this issue climate change and the upcoming G20 summit, the 23rd May elections, progress in road building, transport and dams, including the new Beles hydro-power station that opened on 5th May, advances in agriculture and malaria control, the opening of Ethiopia’s first science academy, tourism and sport are covered. UK readers should look out for Jonathan Dimbleby’s upcoming programme on Ethiopia in his new BBC series - An African Journey with Jonathan Dimbleby – see page 10. Let not the interminable whiners scupper the elections. The elements of democratic election and EPRDF. 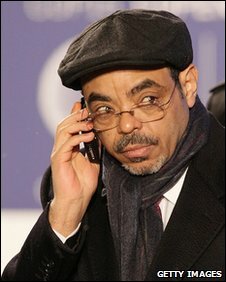 Prime Minister Meles Zenawi: on the eye of the beholder. No More in Our Backyard! The People of Tigrai Forgive but Don’t Forget. Bashing Liberalism: Can “Revolutionary Democracy” Be Democratic Without Espousing Liberalism?